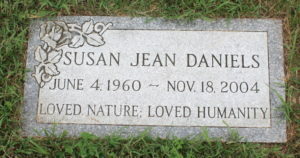 Helen Daniels died in Catonsville, Maryland, on Friday, November 17, 2006, on the eve of the second anniversary of the death of her sister Sue. I knew Helen and Sue Daniels on NYC’s Lower East Side when Helen was in the Brooklyn College Master of Fine Arts Program in Poetry, where she studied with John Ashbery. According to her obituaries, Helen also studied in the PhD program at CUNY Graduate Center and taught English at Hunter College and at the Community College of Baltimore County. When she died, Helen was a candidate for the clergy at the Metropolitan Community Church in Baltimore after studying at the Wesley Theological Seminary in DC. I learned of Helen’s and Sue’s deaths only yesterday. The sense of loss is wrenching, even after the decades since we parted. I remember their razor-sharp intelligence and ever-ready sense of the absurd, and the warmth and generosity they brought to my life, which was very hardscrabble at the time. Helen and Sue were good friends to me. All I can do now is attempt to honor their memory. You can find traces of Sue’s life, and her life’s work for nature and humanity, with a Google search, but a record of Helen’s literary work is lacking. I write in the hope that readers can help me find Helen Daniels’ published poetry and prose, so the world can know her legacy. “I’m not even a dog person!” So he says. But this year Gavin Smith brought home not just one, but two, remarkable dog movies from last year’s deployments to Cannes and Rotterdam — White God and La Mujer de los Perros. White God has a North American distributor for theatrical release, so I’ll focus on La Mujer. Made by “five women and twelve dogs, the majority female,” La Mujer de los Perros (Dog Lady) is an assured, finely wrought character study three years in the making, chronicling four seasons of a woman living wholly in the present, outside the market economy, with a loyal pack of canine companions. The film opens with a soundscape of birdsong and dog-panting, and transitions to an idyll of sight and sound in which every sight is a painterly composition and every sound contributes to a symphonic whole. La Mujer steers clear of sentimentality. The nameless protagonist evokes the hunter goddess Diana in costume and action — she’s a deadeye with a slingshot — but she lives in a very real world where one must hunt, find water, and seek health care to maintain even a bare subsistence living. 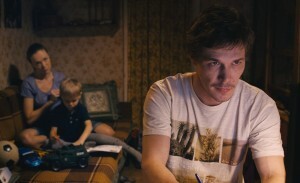 I haven’t seen such a primal film performance since Jennifer Lawrence in Winter’s Bone. The pacing is masterful, and the perspective Olympian, no more evident than in the heart-wrenching, long-lens final shot. U.S. distributors, what are you waiting for? Today it is the honest men who are the fools. Called at midnight to check out a pipe leak in a decrepit housing project, plumber and engineering student Dima (Artyom Bystrov) discovers that the building is going to collapse, perhaps before dawn. Against the objections of his wife (Darya Moroz) — who realizes that exposing the crack in the building, and the corruption that caused it, will destroy any chance of a normal life for their family — Dima resolves to track down the mayor (Natalya Surkova) in the wee hours of her 50th birthday party, attended by all the city’s venal officials. Dima just wants to save the lives of 840 derelict souls. In his world, and ours, that makes him a fool. The building will fall, or not, and he can do nothing to change that. There is no excuse for The Fool not to have theatrical distribution in the U.S. With halfway competent marketing, it will fill seats, make money, and start people talking about important issues.